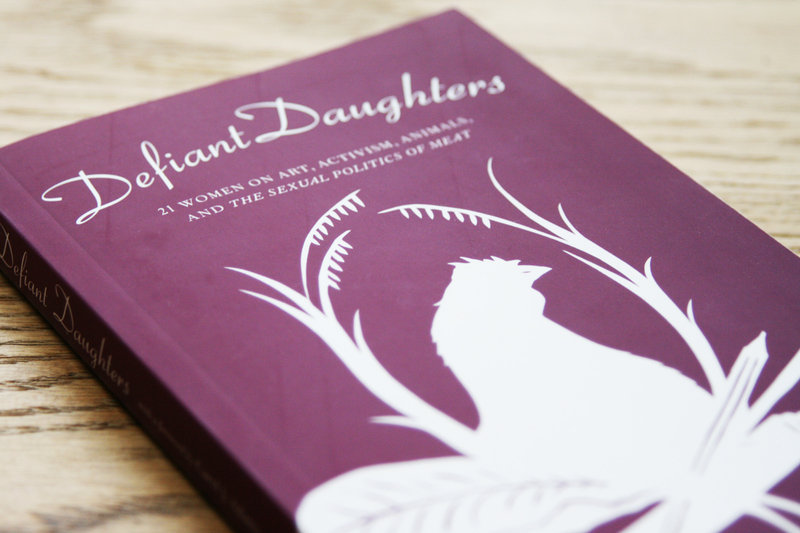 The book Defiant Daughters: 21 Women on Art, Activism, Animals, and The Sexual Politics of Meat, to which I contributed an essay, was published this month. Centered around the work of one of my all-time favorite authors and thinkers, feminist animal rights scholar Carol J. Adams, this collection of 21 essays by diverse women celebrates the legacy of Adams’ book The Sexual Politics of Meat and discusses new perspectives on these topics. Writing my essay for the anthology was an incredible and challenging experience. It enabled me to reflect on the history of my personal coming out, including times that felt confusing, difficult and only sometimes hopeful. Being completely open about my sexual orientation has been a challenge at times and I’ve struggled with closeting myself in scenarios I discuss in my piece. Writing about coming out as vegan and LGBTQ for the book felt like another coming out. As many of us know, coming out is a lifelong process. Coming out in this essay was a gift and a powerful experience for which I am grateful. In honor of the launch, various contributors, folks at Lantern Books, and Carol J. Adams hosted readings and events across the United States. Due to several happy coincidences, I was able to attend three of the readings/events to celebrate Defiant Daughters: a reading at The Last Bookstore in LA, attended by my brother Asher–the subject of my essay; a party at Mooshoes in New York, attended by some awesome New Yorkers and Carol J. Adams herself; and a reading at The Wooden Shoe anarchist bookstore in my current hometown Philadelphia, attended by a childhood friend and some rad Philadelphia vegan Twitter friends. 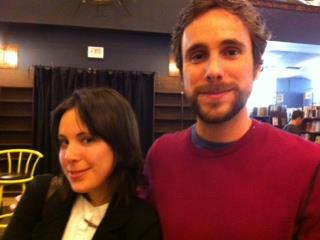 That’s me with my brother Asher at the Defiant Daughters reading at The Last Bookstore in LA. The thing is, while I had written about personal sexuality topics before, I had never read my work to crowds in-person prior to these readings, and this experience was scary for me. I have found that it is a lot easier to hide behind a byline or podcast interview than stare into the face of a crowd and speak openly. 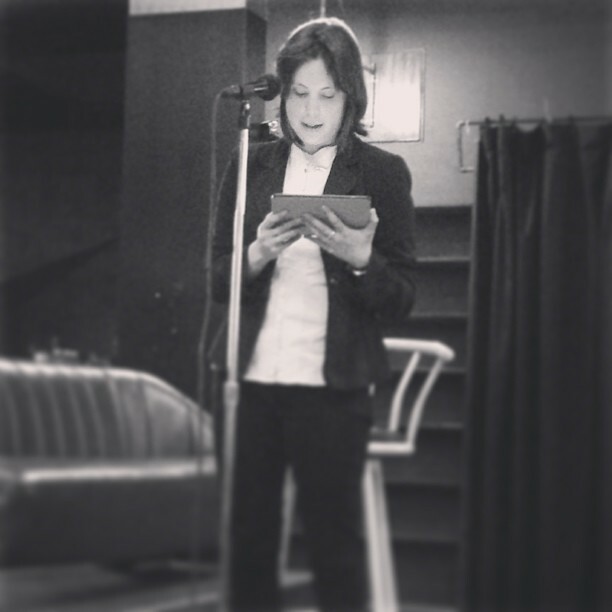 Though I’ve said the words “I’m a lesbian vegan” so many times in writings and podcasts and to my nearests and dearests, reading them to strangers and loved ones aloud, in-person at the various Defiant Daughters events felt surprisingly vulnerable and scary. Everything about the readings was exciting and terrifying, like getting swept up by a gust of wind and falling in love and suddenly realizing I forgot to wear pants all at once. Seeing my fellow contributors looking dapper and speaking with confidence, I mistakenly assumed that I was the only one who felt so nervous about reading (I’ve since spoken with fellow contributors and we’ve realized we’re not alone in having felt nervous!) Since there were so many of us who contributed to this anthology, we never got to have a “team huddle” so to speak, save for mass e-mails of encouragement from Lantern editor Kara Davis. This morning while listening to contributor Jasmin Singer’s take on the launch on the Our Hen House podcast this week (Note: all proceeds from the book go to the invaluable work of OHH, yet another reason to order your copy if you haven’t already done so!) including a discussion about how nervous she was before this reading, I realized that even those who seem completely outwardly confident can feel butterflies when it comes to public speaking on tough personal topics. 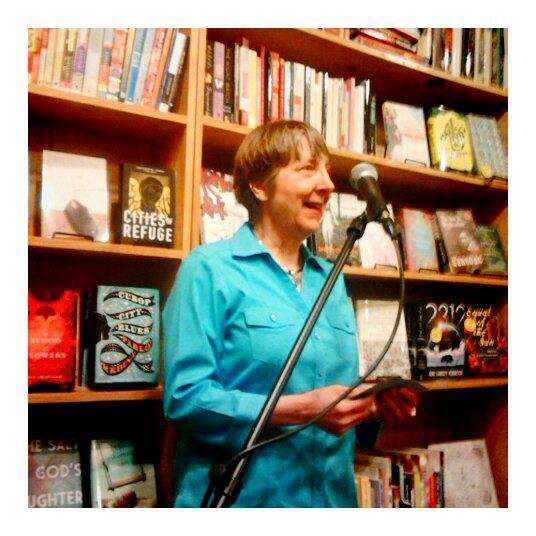 Carol J. Adams, author of numerous books including The Sexual Politics of Meat speaks at Bluestockings Bookstore in NYC. 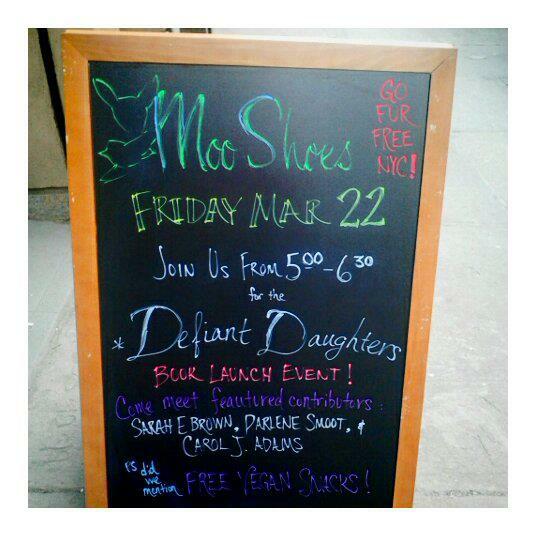 Mooshoes Defiant Daughters launch party sandwich board advertisement. That’s me, reading my essay “Brother Knows Best” at The Last Bookstore in LA–in front of my brother! 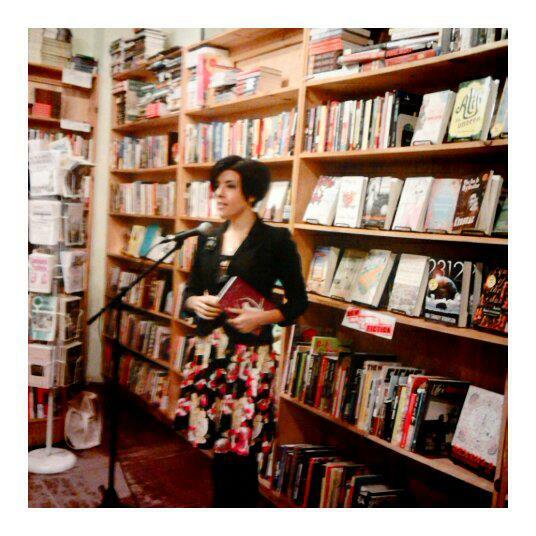 Defiant Daughters Contributor Jasmin Singer at Bluestockings Bookstore in NYC. Anyone who’s listened to Jasmin speak over the past decade at myriad vegan events or who has heard her on her podcast knows she seems at home in front of an audience. This is why I found it so powerful and brave for Jasmin to admit that she also felt so vulnerable reading her essay, which touches on some of the same coming out themes as mine. I am definitely a beginner when it comes to performing in public, and feel much more comfortable hiding behind a podcast or the written word. Sharing our personal truths in front of a group of people–strangers or otherwise– is intense. Public speaking expert Josh Pais did a great video interview with his B-school mogul wife Marie Forleo on how to overcome fear of public speaking. Pais described the “rush” of energy that we feel before we get in front of a crowd as part of the excitement and energy inherent to delivering our truths to a crowd. Pais’ advice–to let ourselves feel our fear and emotion fully to allow it to pass naturally–has been helpful for me in the three speaking events I’ve done for this book. In a way, publishing with so many wonderful women has been the most humbling experience. Many accomplished speakers, activists, PhD candidates, artists and writers are among those who grace Defiant Daughters‘ pages. In my rush to appear like an “author,” I felt shame that I wasn’t already comfortable in my skin in front of a crowd like so many of the other contributors. I shuddered at a lot of the pictures and videos of myself from the events. I felt body image issues come up when I saw unflattering images of myself, mouth agape while speaking, and cringed when I saw myself on video. I’m afraid I’m not as suave as I’d have hoped, but I’m learning to sit with the discomfort of these feelings. They are my own issues to move through, of course, and I didn’t realize how much I still have to work on in the public speaking, body image and self-love departments. This realization of what I still need to learn is one of my biggest blessings of this work. Though I blog at Queer Vegan Food and am out to everyone I know, coming out to new people does at times still feel intense for me. What this experience of being involved with Defiant Daughters has taught me is where I am as well as where I want to be. I want to be able to overcome my shyness so that my work can focus on helping human- and non-human animals. I am committed to overcoming my personal insecurities around being visible in order to be a more effective voice for the voiceless. Have you ever felt nervous about speaking in public, or coming out in any context? I’d love to hear your thoughts in the comments. the more you are challenged with vulnerability, the fear will lessen and the easier it will become! so proud of you sarah!! i can’t wait to read your essay 🙂 CONGRATS!!! on March 30, 2013 at 10:28 pm | Reply Sarah E.
Thanks, Heidi! I appreciate your support. on March 31, 2013 at 11:13 am | Reply Sarah E.
You are an extremely bright, talented analytical thinker and I look forward to reading more of your personal writing. I’m proud of you for carving your own space to express your truths. I’m truly looking forward to reading your entry, Ali. Thank you for sharing here. Well, I thought there was a great deal of wonderfulness in what I saw, which admittedly was mediated as I am on the other side of the Atlantic. So well done you! I thought you were remarkably poised! I always find television the hardest, but I find maintaining a consistent eyeline (i.e. looking at the same place) really helpful when the camera is close up. Just trying to do that is so hard it dispels my nerves! When we embody freedom and compassion, and speak with love, those who watch us are quietly cheering us on. Or in my case, not so quietly. Yay you! on March 31, 2013 at 11:14 am | Reply Sarah E.
❤ That's great advice, and thank you so much Kirsten! I love this post. Having to keep coming out all the time, over and over, certainly does highlight the areas of self-love that we still need to work in. It’s pretty amazing, actually. Your speaking and sharing and openness is such a gift to me and the world! on March 31, 2013 at 3:26 pm | Reply Sarah E.
Thank you so much for sharing this brave, wise comment Rosie. I am so proud of you for putting yourself out there in spite of fears, and grateful for your words of wisdom. The fitness world is incredibly lucky to have you. Wow! What a great post! Although I have spoken in academic settings, speaking at the Defiant Daughters events was so much more challenging. For me, having an emotional connection to the work and that it was a slice of my own personal journey, really put some anxiety in the process of speaking. I too felt vulnerable and was questioning my abilities: speaking too fast, stumbling over words that I wrote and posture/physical issues. Now that the events are over, I realize that although my readings were ‘perfect’ they were important in my growth and development of who I want to be. So, for every great public speaker, there should be many newbies who are just blossoming and developing their own methods. on April 1, 2013 at 1:05 pm | Reply Sarah E.
Sarah, This post is so infused with your transparency and humility. Really inspiring and a great example of you, yet again, keepin’ it real (and really interesting). You make me so proud sometimes, it hurts. Yeah, I can relate, lol! Thanks for your your words, your presence, your actions on behalf of a better planet. on April 9, 2013 at 1:35 pm | Reply Sarah E.
I can’t wait to read this book! Thanks for sharing your story about feeling vulnerable. When influential people like yourself do this, it empowers other people to be brave too! I wish I could have been there to hear the talk. Keep up the amazing work!